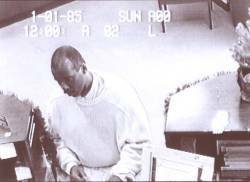 (January 2, 2003) -- LBPD and the FBI are asking for the public's help in identifying and locating the suspect (photo right) wanted for two LB bank robberies in December. On December 12, he walked into the California Bank & Trust at 444 W. Ocean Blvd. and demanded money. On December 23, he walked in the 1st Bank and Trust at 100 Oceangate and demanded money. In both cases, he fled with a significant amount of money. Witnesses described him as an African-American male, balding, 5'8" to 5'10", 190-200 lbs. with a thick mustache. Anyone with information is urged to call LBPD Robbery Detective Jeff Liberman at (562) 570-7464 or the LB FBI at (562) 432-6951.